So Artpentry Art Gallery (sounds kind of redundant doesn’t it?) just celebrated it’s one year anniversary recently. It was a year of art, beer, burgers shirts, wooden beards and most notably a year full of Gentlemen’s Boomboxes. 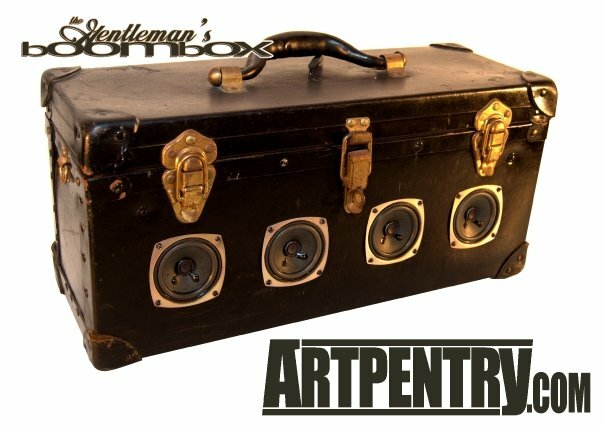 The one-of-a-kind boomboxes made out of antique suitcases have been a big hit at the Chicago gallery (they make great Father’s day gifts too) and FloydthefourtH is officially celebrating the one year anniversary of the Gentleman’s Boombox this Friday the 11th during the Pilsen Art District’s 2nd Friday. Every second Friday of the month all the art galleries in Pilsen open their doors from 6-10pm for a night of food, friends and art so stop by if you’re in the area to help celebrate and maybe buy some cool art. 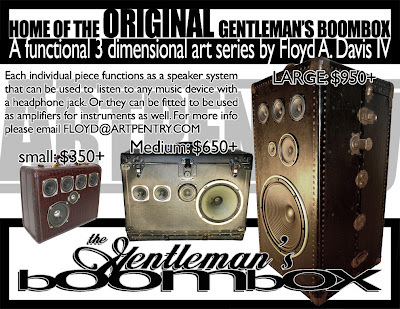 If you can’t make it you can always contact Floyd at 312-NAG-TOTS or floyd@artpentry.com to see if you can have a boombox shipped to you. These pieces are even more impressive in person so I highly suggest you stop by for a look and a listen. And a purchase. Definitely a purchase. If you catch me there I’m willing to give free autographs with a purchase of anything, I’m humble like that. Plus there’s rumors that a free C4 show will be happening afterwards around 10pm right across the street from Artpentry at EP Theater. Just sayin.